I got an interesting email from a reader who didn’t want to be mentioned (something cloak and dagger no doubt). Anyway, he/she wanted to know why ESRI doesn’t get more involved with the GIS community. They acknowledged that there are a couple ESRI blogs, but nothing really engaging from any of them. I’m not really sure why there hasn’t been more involvement with the ESRI folks on the blogs. I think there might be a couple of reasons. First I think everyone acknowledges that culturally it is very hard to blog at a company and I think that might be part of it. I’m not sure if there is any policy at ESRI for blogging or what backlash there has been from blogging by ESRI employees. I think the closest we saw was Eric Bader’s blog post gain a disclaimer and the fact he hasn’t followed up on it. Blogging is a very large cultural shift for many companies and I think there will be more from ESRI in the near term (Brian Goldin mentioned blogs were coming soon from ESRI). I’m guessing ESRI employees will be more apt to blog on an internal blog service than they would be on their own as the boundaries are more defined. Some on this blog have mentioned Microsoft and Sun as great examples of blogging but they have been doing this for years longer than ESRI has. So while the blueprint is there, ESRI is taking is slow. 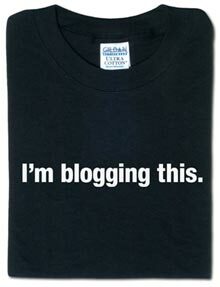 The second issue issue he/she mentioned was why ESRI wasn’t getting more involved with blogs. I can’t really answer that one either, but I’ve seen more @esri.com emails in comments on this blog and other in the last few months. I know Andrea Rosso has been commenting on this blog where we’ve talked about ArcWeb and others have chimed in also. I think if they could talk more about 9.2, we’d see so much more. Of course the other side to that is ESRI users are in the middle of 9.1 and while they are interested in 9.2, it really doesn’t help their production. We work with the USMC all the time and they are still on 8.3 and I’m others have the same issue. I’m glad to see Brian Goldin has said 9.1 will be the focus of the Dev Summit as most developers are working on 9.1 right now and things like the new Web ADF are really cool, unless it works with 9.1 it really isn’t any current value to us. So lets see what happens at the Dev Summit with this new focus on community. You can be sure that developers are going to be letting ESRI know what is working and what isn’t working. I think we are all going to have a great time at the Dev Summit and we could be in for quite a change at ESRI because of it. Personally I’ve seen a change in my talks with ESRI employees so if they can figure out this blogging thing, we’ll all be in for quite a treat.